Reading the Fantastic Four comics from the start. The Infinity War crossover continues in issue #367. First Reed met his doppelganger, and now it’s Ben’s turn. So, Infinity War. Magus, the evil doppelganger of Adam Warlock, is using a bunch of cosmic cubes to create evil doppelgangers of all the Marvel heroes. Also, Thanos is hanging around. Last issue, Reed’s doppelganger successfully defeated him and took his place. 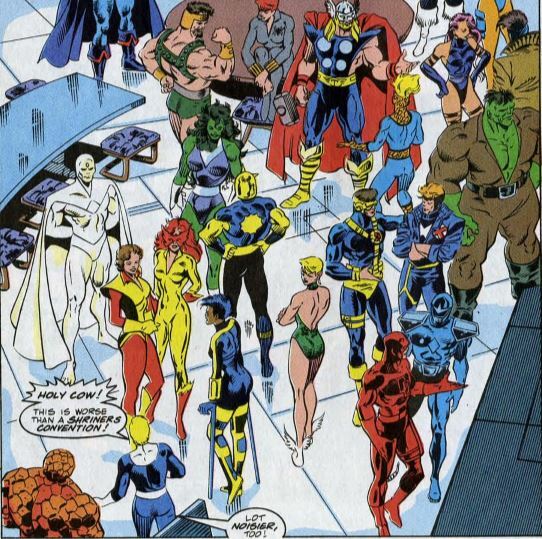 This issue begins with Evil Reed organizing a summit at FF headquarters, inviting the Avengers, the X-Men, the New Warriors, and Alpha Flight, to discuss the doppelganger situation. (Later in the issue, we’ll see he also invited Daredevil.) Suspecting something is up, Sue sneakily uses Reed’s encephalizer device to run a scan, discovering that Reed has been replaced by a doppelganger. Puppet Master says he’s only following Ben because he’s concerned about Alicia, and he accuses Ben of betraying Alicia. 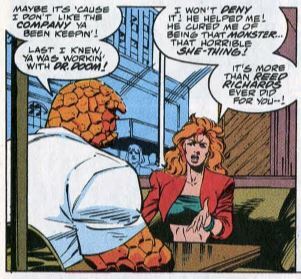 Ben says it’s complicated, what with the whole replaced-by-a-Skrull thing. Before they can converse further, a portal opens behind Ben, and out comes Ben’s doppelganger. It appears in Ben’s stronger-than-usual spikey form, and the two Things fight, damaging some nearby buildings. They make their way to a construction site, trashing it as the fight, and then onto a crowded subway platform. Puppet Master saves the day by carving a puppet of the doppelganger right there on the spot, and then throwing it onto the subway’s third rail, electrocuting both the puppet and the doppelganger. At HQ, Sue frets about what to do about Evil Reed, when she discovers Wolverine inside the building, sneakily getting around all the building’s automatic defenses. Ben returns from the fight, and there’s a bunch of business with Sue using the encephalizer to make sure Ben is really Ben. Then Johnny arrives, and we repeat the whole scene to determine that Johnny is really Johnny. 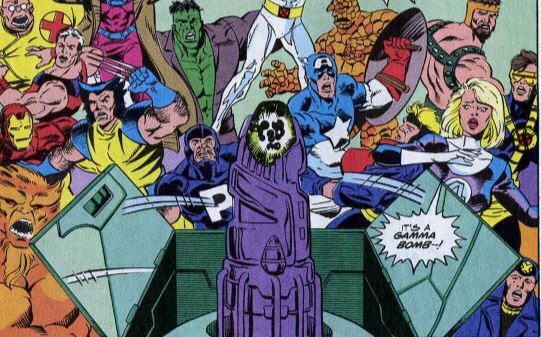 Some of the heroes think that Wolvie and Daredevil are the doppelgangers, so we get the requisite scene of all the superheroes fighting each other. Evil Reed than reveals a gamma bomb hidden inside the room. The final panel is an explosion bursting out of the top floors of the building. Fade out: Once again, Sue takes on a leadership role in Reed’s absence, this time also taking over the gadgets and gizmos in Reed’s lab. 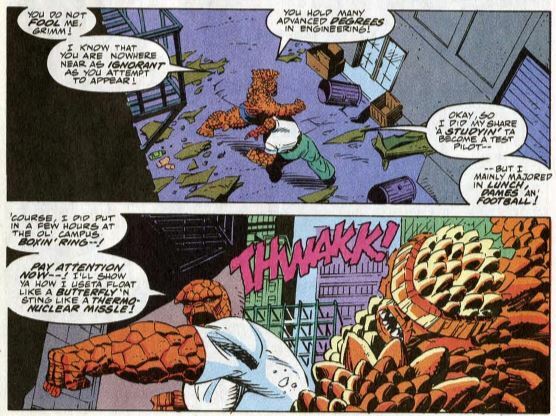 Clobberin’ time: A line of dialogue states that Ben has several advanced degrees in engineering. He admits he got these degrees before joining the air force. So, does that mean he went back to college after the air force in order to meet Reed? Flame on: Johnny promises to keep an eye on Evil Reed during the summit, but once the fight breaks out, he’s nowhere to be seen. We’re probably meant to think that he’s in the mix, fighting with everyone else. Fantastic fifth wheel: I’m still baffled as to how Sharon’s new role as Dr. Doom’s assistant is not a big reveal, but written as something the reader is already expected to know. But, she’s back now, and get ready for her to go through some serious ups and downs in issues to come. She-Hulk is present at the superhero summit, but doesn’t get any lines. Like Johnny, she’s not seen during the big fight. Crystal had joined the Avengers by this time, and the Marvel Wiki insists that she also attended the summit, but I don’t her anywhere. Four and a half: This issue reestablishes that Franklin’s world-ending mutant powers might be returning. Also, we see that Reed (or Evil Reed?) has placed a robot bodyguard in Franklin’s bedroom, one that has “the offensive punch of a small army.” What the heck? Trivia time: The superhero with the crutches is Silhouette, an associate of the New Warriors, who still recovering from a gunshot would she got in New Warriors #2. Spider-Man is not present at the summit because he was injured while fighting his doppelganger. He’s in the hospital with Black Cat acting as his bodyguard. Fantastic or frightful? 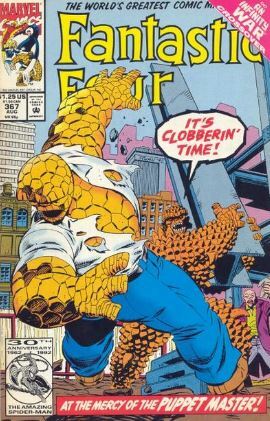 The artwork is really great during the Thing vs. Thing fight, but other than that, there’s not a lot to recommend here. All the characters are written inconsistent and a huge chunk of this issue just repeats what was in another comic. Next: All X-Men, all the time.